Need a speckled hen and not near a cab rank, where do you find some sausage and mash? Why, you go to your local cash machine of course and, if you live in east London, you might even come across one which gives you the option of proceeding in a variety of languages - and offering cockney. The idea is the brainchild of Ron Delnevo at the Bank Machine Company, which already offers the option of Welsh - where else but in Wales - and is introducing Gaelic in Scotland. "When someone suggested cockney they were only joking," he says. "But I thought why not?" He maintains that it makes it more fun for people to use cash machines and that it also creates a conversation piece. So a speckled hen becomes £10, a cab rank is a bank, and sausage and mash is cash. Ismat Ullah never understood why people laughed as they walked away from the cash machine situated in front on his convenience store in East London's Commercial Road, until somebody explained to him the intricacies of cockney rhyming slang. "I am glad to hear about people walking away from the machine laughing because that is how we want people to react to it," Mr Delnevo says. "At the same time it helps foster a bit of British culture." The first machines offering cockney prompts were introduced for a three-month trial run in 2009. There are now 30 machines and with the Olympic Games on the horizon, Mr Delnevo has plans to introduce more. "We will have one in the pub on the corner of the road leading to the Olympic Stadium," Mr Delnevo explains, while others are being scheduled for the area in east London which will attract hundreds of thousands of visitors during the games. It might have started as a novelty but many people choose the cockney option. 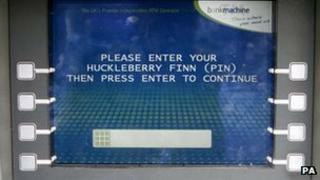 "On our cash machines in Wales less than 1% of people opt for the Welsh language, whereas between 15-20% opt for cockney when given the chance." The company has also been responsible for introducing cash machines which only dispense £5 notes - fivers as they are colloquially named or Lady Godivas in cockney. It also allows people to withdraw a pony - which is £25 to non-cockney folk. "I was talking to Andrew Bailey, the chief cashier of the Bank of England, and he said they were trying to get more £5 notes into circulation," Mr Delnevo reflects. "We were getting to the state where we were a £20 note society - handing over £20 for an item which cost £4.50 and handed back enough metal to act as an anchor for the aircraft carrier Ark Royal," he says. He says that apart from £5 notes making cash more convenient to use, it also helps people budget better. "People tend to take out much less but come back more often. They think if you take out smaller amounts you spend it less quickly," he asserts. Then there are people who are not that well off who, towards the end of the month, only have £7 or £8 left in their account and therefore cannot access it because machines usually have £10 as a minimum withdrawal. There is no charge for using one of the £5 note cash machines and one of the busiest in the country is located at East Croydon station. "People using that station are not necessarily poverty stricken, but a lot of them are strapped for cash at the moment," Mr Delnevo concludes. Why is the five pound note important?